A monthly journal, Labour Law Reporter, now popularly known and authoritatively referred as LLR, is designed to be useful to the Human Resources People/Personnel Managers, law practitioners as well as those implementing, administering and adjudicating Labour Laws and Industrial Relations. LLR publishes articles, notes and comments, and detailed commentaries on recent cases and legislation in the field of labour laws, besides publishing solutions to the problems on employee-employer relations, ESI, PF, Bonus, Gratuity & all other employment related Acts, applicable especially in the Indian context. LLR has always kept pace with the changing times. That, not so recent transformation of “Personnel Management” into “Human Resources Management” has been very well spotted by LLR and a segment on Human Resources Management was added, which is now “an inseparable part of the journal”, as remarked by one of the readers of LLR. For over four decades now, LLR is an inseparable stationery on the desk of an HR Professional and a Labour Law Practitioners. 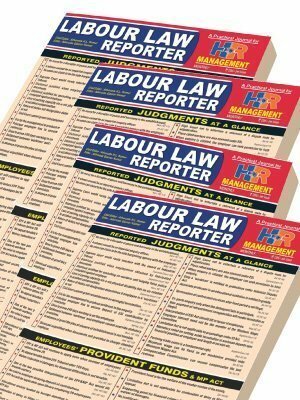 Labour Law Reporter is a must-have journal for all those who wish to find a source of quality reading material relating to Employee-Employer Relations, Labour Laws in India and important judgments of Indian Courts in that connection, more particularly with authoritative head-notes and the ratio at a glance. What exactly are my legal rights? Besides paying or receiving salary, what are the additional duties I need to perform? How should I manage my team for best results? How and from where can I understand the various labour laws, their provisions, latest amendments, etc., properly? Labour Law Reporter has the answer to all such questions and more. With millions of readers across India and abroad, LLR enjoys a status of being an inseparable stationery on the desks of HR Professionals and Law Practitioners. It is matter of pride of everyone associated with LLR that it is frequently and authoritatively quoted by the Supreme Court, High Courts, Tribunals and Labour Courts of India. 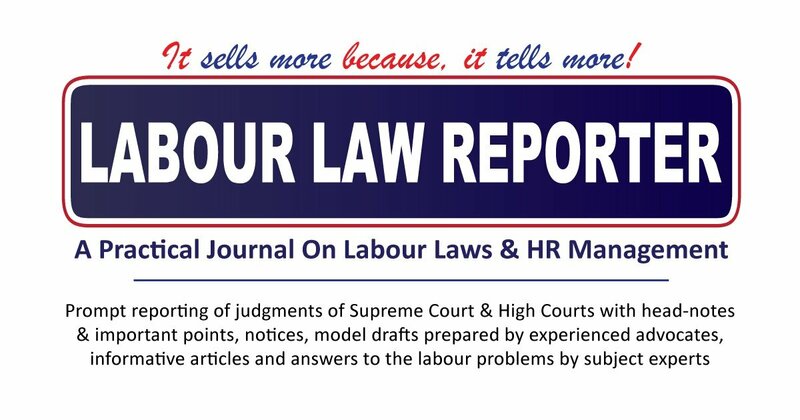 With a record of nearly 5 decades of continuous publication since 1969 Labour Law Reporter is the most preferred monthly journal that covers news, views, articles, facts and figures on Indian Labour Laws and Human Resource Management. It is a practical journal for HR Management, popularly known and authoritatively referred to as LLR. We are not only publishing a monthly journal named Labour Law Reporter, but also keep organising seminars and workshops on various useful subjects relating to labour laws, especially in India. Way back in 1969, the entry of LLR was at a particular point of time when there were other journals / reporters also with wide circulation. A young advocate specializing in labour laws, being ardent in reading the judgments, found that the journals claiming to be about labour laws were competing with each other not for quality reporting of judgments but swallowing the volume with judgments pertaining to government servants, Police and Defense Service personnel which were of least utility for those specializing in Labour Laws. The journals, as competing, were perhaps more concerned about number of pages and not the relevancy of judgments and in this race the subject ‘labour laws’ was getting neglected overlooking that there are over 178 Central and State Act. It was that urge to do quality reporting of judgments pertaining to Labour Laws which motivated the young advocate, H.L.Kumar, to come out with a one-of-its-kind journal called “Labour Law Reporter“. LLR is one of the most popular and informative journals. It has educative articles, informative news, templates of letters and forms, court judgements, etc. presented in a simple yet enlightening manner. Readers find enriching experience reading this journal, not only when they are looking for answers to questions pertaining to employee-employer relations, but also when they want to learn the latest in the Indian Labour Law scenario. Mr H.L. 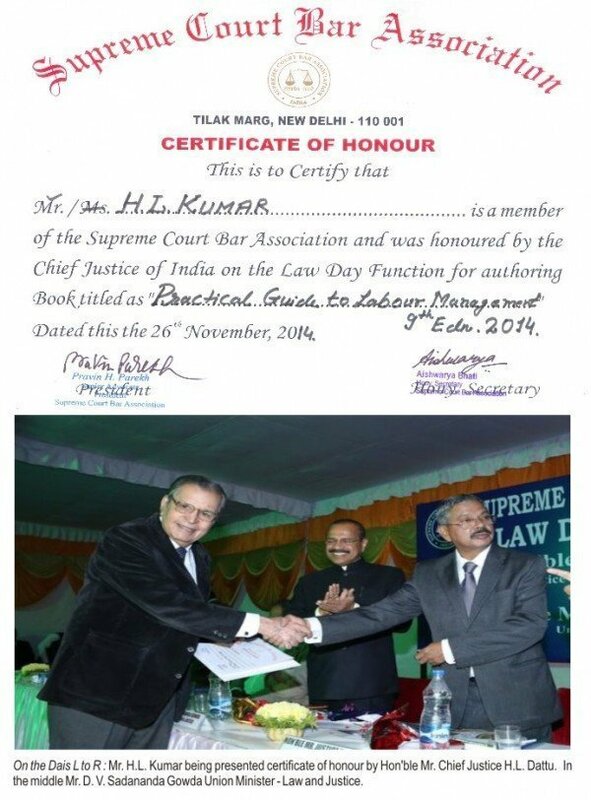 Kumar, the founder of Labour Laws Institute is a renowned personality amongst the followers of Indian labour laws. An excellent human being and a thorough professional, Mr Kumar has argued and contested landmark cases in various courts and is permanently retained by national and multinational companies. Mr. Kumar is also a member of Labour/HRD Committee of PHD Chamber of Commerce & Industry and Associated Chamber of Commerce. He has been on the faculty of AIMA for addressing Seminars on Contract Labour (R&A) Act and Labour Laws as organized all over India. He has been on the faculty of AIMA for addressing Seminars on Contract Labour (R&A) Act and Labour Laws as organized all over India. Mr. Kumar has also written more than 30 BOOKS, on labour and industrial laws some of which are text books and also approved by Employees’ State Insurance Corporation and Employees’ Provident Funds Organisation. Mr Kumar has been profoundly honoured with Lifetime Achievement award for his sterling contribution in the field of labour and employment by The Economic Times and Confederation of Indian Industry during an IR conclave at The Oberoi, New Delhi in 2013. Apart from this, Mr Kumar has been coveted with many prestigious awards in his half a century long career, that speak volumes of his calibre. Factories Act is one of the most elaborated Labour Law Acts in India. Retd. Chief Inspector of Factories, Delhi, Mr Bhasin answers queries related to this Act. He gives viable solutions to the related problems, gives appropriate answers to questions and queries related to the Act. ESI is a subject of complexity and so are the problems, questions and queries related to it. However, Dr Khetal has all the answers and workable solutions on his fingertips. Dr Khetal was the Additional Commissioner (Retd.) ESI, Delhi. Not for nothing that Dr Khetal is on the elite panel of our Experts. Mr Kaushik answers questions related to Human Resource Management. His expertise on the subject is impeccable and solutions given by him on the problems raised by the readers are very practical. Readers find these solutions to be available nowhere else. There are 178 Central and State Acts on which LLR has been reporting, which is way ahead of any other Journal in this category. LLR is the most sought after Journal, when it comes to finding quick solutions related to ESI, Provident Funds, Factories, and other Labour Problems. Therefore, it is not without reason that LLR is the No. 1 Choice of HR & Personnel Executives, Law Practitioners and those implementing, administering and adjudicating Labour Laws and Industrial Relations. LLR keeps you ahead of others in terms of understanding the labour laws in India. Readers have often quoted that subscribing to LLR has many a times saved them cost of hiring a consultant.